This Ottawa 67’s blue liner has had a busy year. Less than three months after the Barber Poles were eliminated from the playoffs in 2017, Bahl was invited to the Team Canada Summer showcase. Here he was able to make a name for himself and was named to Team Canada’s Ivan Hlinka Memorial Tournament Team roster. Bahl and Team Canada would drop game one of the tournament but that didn’t faze the team in the slightest. They would go on to win the rest of the round round robin and eventually the gold medal game where Kevin picked up an insurance goal en route to victory. A couple weeks later Bahl was back in Ottawa preparing for the 2017-2018 OHL season. Less than a month into the season, he earned a spot with Team OHL for Game Four of the Canada-Russia Summit Series. 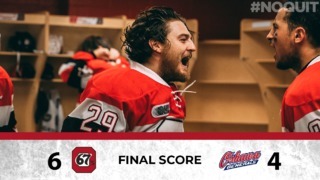 Team OHL would go on to win Game Four 4-2 with Kevin once again stepping up in the big moment to score an insurance goal early into the third period. 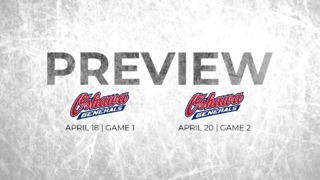 Kevin Bahl picked up an insurance goal early into the third period for Team #OHL last night during Game 4 of the Canada/Russia Series. Bahl returned to Ottawa immediately after the Summit Series in time to join the team for a home contest against the Bulldogs. He would score a goal very similar to the one he’d scored nights before against Team Russia. 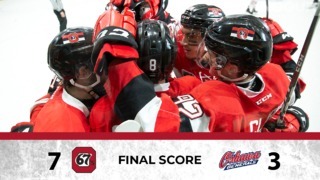 Kevin Bahl’s first goal of the year and first #67s goal today. Bahl would continue to be a force on the backend for the Barber Poles and impressed scouts in the NHL, enough so that the 6’6 defender was named to the CHL/NHL Top Prospects game featuring the brightest young stars in the OHL, WHL, and QMJHL. Despite losing the game, Kevin would step up once again and demonstrate the offensive side of his game scoring a goal for Team Orr in the second period. In OHL, Bahl continued cementing himself as a solid shutdown defencmena but he also worked on improving his offensive game. Despite only scoring one goal this season, Kevin more than quadrupled his point total from the year prior going from 4 points to 18. Bahl also provides a big body on the back end towering over most of the competition at 6’6 and weighing over 230lbs. Although not an overly physical player, Kevin is able to use his body when he so chooses. It appears as if another busy summer lies ahead for the young defenceman. Shortly after the 67’s were eliminated from the playoffs, Kevin got the call to once again represent Canada at the 2018 World Under-18 Championship. Although the tournament ended earlier than desired, Kevin again scored a goal at the tournament, proving he comes to play in the big moments. When NHL Central Scouting released their final rankings, Bahl was the highest ranked 67 and the 29th ranked North American skater. Kevin will look to have his name called come draft day this June in Dallas. Bahl will provide shutdown D and the ability to step up in the offensive zone wen needed for whatever team selects him.